June 2, 2014 – Expedition 40 is beginning its first full week together as a six-member crew. The station residents were busy Monday with science work, an emergency review and crew orientation activities. Commander Steve Swanson joined European Space Agency astronaut Alexander Gerst for eye checks as part of the ongoing Ocular Health study. The duo also practiced using a tonometer on an eye simulator in conjunction with doctors on the ground. Scientists are exploring why some astronauts are returning home with diminished sight after long-duration missions. Swanson worked on the Veggie experiment adding water to plant pillows and checking lights on the botany science hardware. At the end of the day, the commander removed mesh covers and cleaned grilles inside the Japanese Kibo lab module. 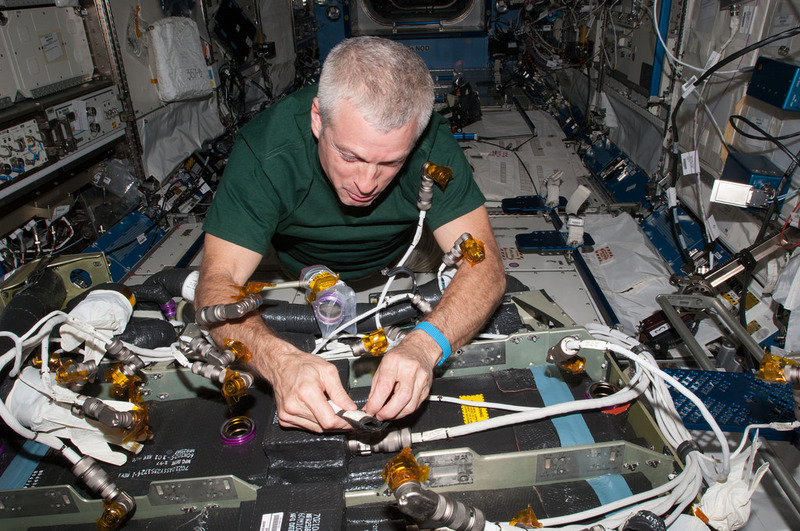 New Flight Engineer Reid Wiseman worked throughout the morning on a fluid physics experiment using a magnet to mix colloids. The Advanced Colloid Experiment-Microscopy-2 studies the microscopic behavior of microscopic liquids and gases separating from each other. Results may help scientists learn how to manufacture longer lasting consumer products. After two crew orientation sessions Monday, Wiseman performed some minor plumbing work activating a high-flow fluid transfer pump to transfer fluid to a wastewater bus. Gerst, Europe’s first station crew member since Expedition 36/37, set up the Resist Tubule experiment, another botany experiment. He checked lamps on the microscope which is part of the experiment hardware for the study that observes gravity resistance in plants. On the Russian side of the International Space Station, the three cosmonauts focused on cargo transfers, science and crew orientation. Flight Engineer and veteran station resident Alexander Skvortsov stowed trash and discarded gear inside the ISS Progress 53 (53P) resupply ship. The 53P will undock from the aft end of the Zvezda service module June 9 for a fiery destruction over the Pacific Ocean. Expedition 40’s newest cosmonaut Maxim Suraev off-loaded gear from the Soyuz TMA-13M spacecraft. Earlier, he donned an electrocardiogram holter to monitor his body for 24 hours for the Motocard experiment. Suraev last visited the station as an Expedition 21/22 flight engineer. Flight Engineer Oleg Artemyev worked maintenance throughout the station’s Russian segment. He performed plumbing work filling a water supply bag then later checked a network router. Finally, all six crew members spent a couple of hours together after lunch as the new trio familiarizes itself with station activities. They first joined each other to review their roles and responsibilities in the unlikely event of an onboard emergency. Next, the veteran trio gave the new residents a tour of the orbital laboratory pointing out the various features of the station’s modules.